NO PEBBLE MINE #343: Back at their mid-river cabin, on an island in the Goodnews, my new friends from the ADF&G that have been assisting my exploration of the watershed, have begun prep on our final dinner together, as tomorrow they are taking my downriver to the village, where I expect a plane to pick me up. As usual, I alternate between helping inside, and watching the show outside, which, again this night, is very dramatic. It is definitely colder tonight, so the fluxing state of the fog is more pronounced, as it makes things appear, and disappear. Although it seems we have a “cold and clear” evening coming, when I mention that to my hosts inside, they tell me something quite different, that will affect our morning plans. The cabin has a radio, and as do all Alaskans, my hosts listen to the radio for weather forecasts, before going out on the river. They tell me there is an “epic” front coming in from the North Pacific, that is due to strike about midday tomorrow. Accordingly, they want to get moving downriver, early in the morning, so they can be back here before the storm rolls in. They also contact my pilot to let him know, I will be ready early, and he needs to come before the weather arrives. NO PEBBLE MINE #342: After lunch, my guides from the ADF&G and I, have been out on the water for nearly 6hrs., and although it is not raining, the wind is chilling and taking a toll on us. Eventually we decide to head back downriver, and return to the warmth of their cabin. The rain of the previous days, and the cold weather, suggesting the income of fall, has begun to set of select vegetation. The trees and shrubs have not yet turned, but patches of tundra have begun to redden, and berries are everywhere. Well down out of the mountains and the narrower part of the river, we are now winding our way through a broadened plane with mature trees and dense bush lining the shore. One embankment, though, is especially vibrant, so we pull in to shore for a quick climb up and look-around. We may have picked on of the most bio-diverse spots on the entire river. 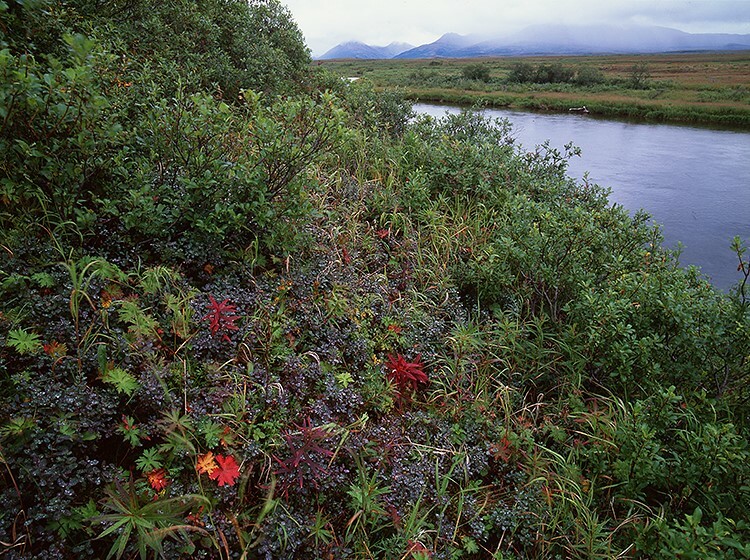 Tundra, mosses, lichens, berries, summer flowers, invasive shrubs getting started - this spot has it all. We are nearly to the cabin, and this is likely to be my last view of this part of the Goodnews, so we sit for awhile and just enjoy our surroundings. The wind is even kind, and it dies down completely. NO PEBBLE MINE #341: I have one more day to spend with my hosts from the Alaska Department of Fish & Game, before I am due to be picked up by a plane at Goodnews, a native village at the mouth of the Goodnews River. Camped out at their mid-river cabin, we wake to lots of clouds and wind, but a relatively rain-free, morning. Back in their boat, today we are going up a different fork of the Goodnews that will take us closer to some notable mountains. If you look at my link, you can see that the Goodnews River system is an expansive complex of drainages that feed into the river from hundreds of locations, across many square miles of backcountry. This river also does an astounding amount of meandering. My guides are actually ADF&G enforcement officers, and this morning we speak with two shore-based hunters, but we do not encounter anybody fishing or camping. They push the boat as far upriver as we can, before it becomes too shallow. There are numerous opportunities for us to get out and wander around, and this POV (above) is the farthest point of our adventure. NO PEBBLE MINE #340: Back in camp, and into a parka and shell pants, the warmth of the cabin and stove flood through me. 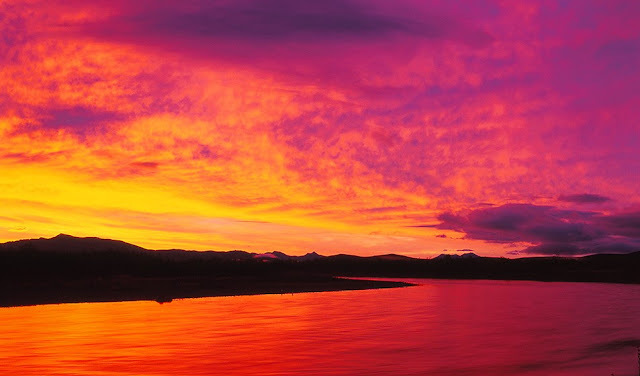 My hosts are busy doing meal prep, and once again, our amazing location on a big sandbar at mid-river, affords an expansive view of the western sky, which for the second night in a row is “going-off". Having seen my behavior the previous evening, my colleagues now understand I am chasing the light, and actually tease me that “the sunset pictures are all going to look the same, because EVERY night there is a great sunset.” While I know that not to be true, it would be hard for me to prove, based on this visit. 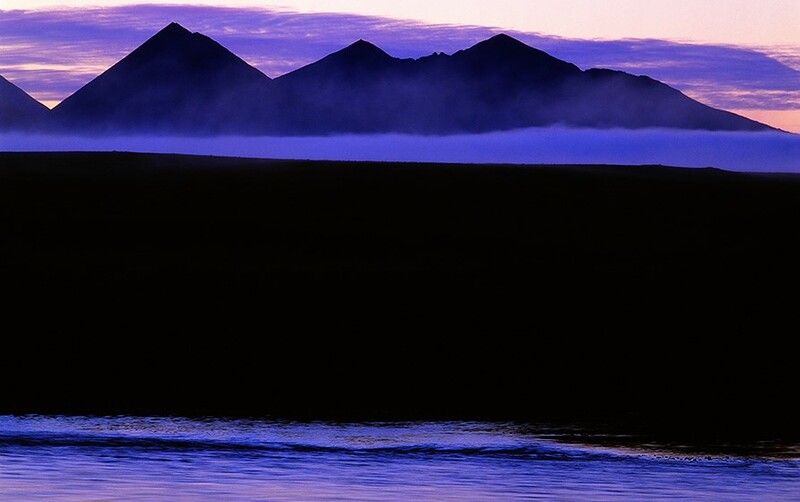 As I stand at the edge of the sandbar, the sky color deepens, and the light begins to fade. All I can hear are the riffles of the water,..and then, somewhere out there in that blackness, the second wolf of the day speaks up,..probably saluting this sunset as well. Good day, Goodnews! NO PEBBLE MINE #339: My colleagues/escorts/tour guides from the ADF&G, have really gone out of their way to help me get a visual sense of the Goodnews River system. We have spent a long day going as far up this branch of the river as we can, and we have done a number of short hikes onshore. Now, headed back downriver, and to the west, we encounter a heavier rain, and increasing winds. We are all cold, and I suspect all look forward to being back in the ranger shack with a fire in the stove. I know I do. However, we make one last stop. On a section they identify as non-Native land, they tell me we are all going ashore to pick berries. The bush is dense, and wet, but there ARE berries everywhere - blueberries, salmon berries, elderberries, berries I have never heard of - and all VERY tasty. I am told we will have a killer glaze on the salmon tonight for dinner, and pancakes in the morning will be awesome. I am cold. It can’t happen soon enough. 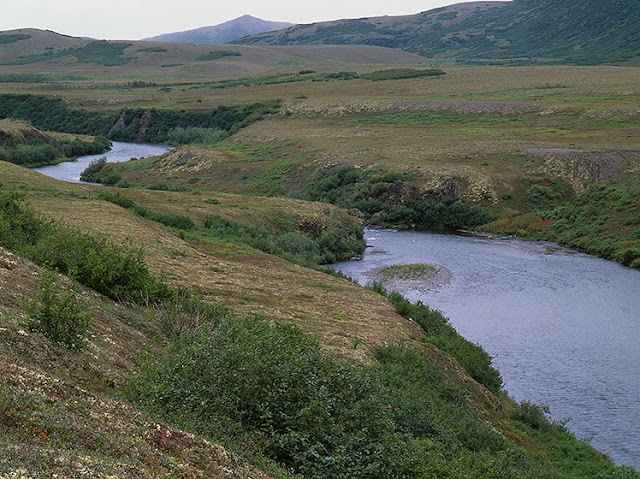 NO PEBBLE MINE #338: Because we are in a boat with a shallow draft and a lot of power, we continue to push up into the headwaters of the Goodnews River, even through some sketchy shallows, and rapids. My two hosts, enforcement officers from the ADF&G, patrol this river daily though, so they know exactly what we are doing, and I am just along for the ride and the view. We are now at a point where the embankments have flattened out, and the tundra rolls off in every direction around us. The Goodnews is also shallow, narrow, and meandering enough to make it impossible for a plane to land, so we are beyond the realm of floaters, fishing and camping. There is no one else out here but us,..and a lot of animals. Because the terrain is navigable, they want me to take a hike onshore they think will prove interesting. Of course, they tag along as my bodyguards, both sporting holstered pistols, and rifles over their shoulders. The consensus here is that the views are expansive enough that we will see whatever animals (bear) might be out there, before they become of danger to us. We do see several moose, we hear wolves, and then over one of the rolls in the landscape, this nicely constructed beaver pond and lodge complex appears, replete with busy beavers, another moose, and several eagles. In a light, on-and-off rain, we snack here while watching the activity, and then work our way back to the boat. 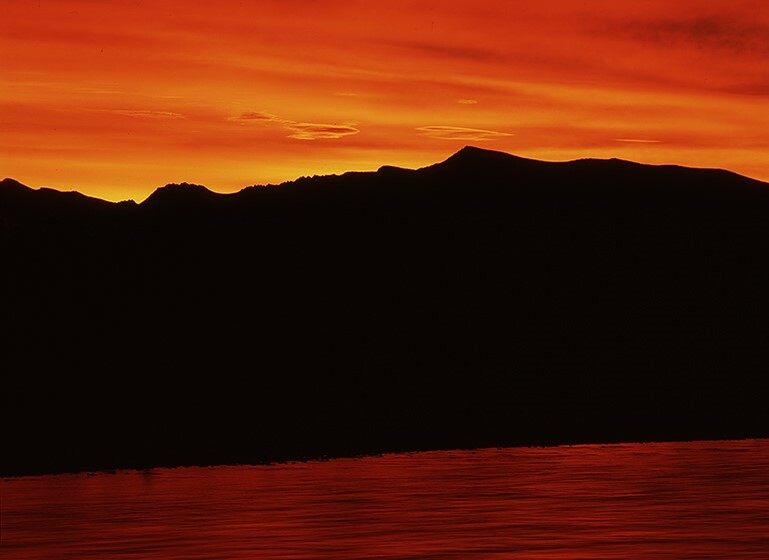 NO PEBBLE MINE #337: The spectacular sunset of the previous night (last two posts) ushers in weather from the Pacific, so we awake to a blustery, cold, and rainy morning. It is nice to be able to have a casual breakfast in the warmth of the cabin in which my two hosts reside while doing their summer enforcement patrols on the Goodnews River for the Alaska Department of Fish & Game. Back out in the boat and on the river, it is another story, and we all fleece-up and put on raingear. Their camp is situated in the last really broad section of the river, and as we move upriver, closer to headwaters, the river narrows, and the banks steepen and grow taller. We do not see many floaters on the river this morning, probably because of the lousy weather, but we do find many still in camp. We are now deeply into Native land, upon which there is no trespass to camp or fish. Nonetheless, we make several stops to inform groups that they need to remove their encampments from the shore, and find a sandbar where they can camp legally. Curious about how enforcement plays out, I ask if the penalty of being fined accomplishes anything, AND what about the houseboat guy we encountered yesterday? They tell me they reported him last night on the radio in the cabin, and Native enforcement officers will deal with him, arresting him for trespass, seizing his illegal fish catch and fish-wheel, and, likely, breaking down his boat. My hosts assure me working it this way will be far more effective, then if they took action. They also point out that many floaters who are fishing, are with local guides, and the guide can loose their license if the floaters break the law. NO PEBBLE MINE #336: I am sure the two Alaska Department of Fish & Game officers, in whose cabin I am having dinner, think I am a little nuts, because I keep leaving our meal to go back outside. As you see in the last post, there is quite a show going on, and this is SUMMER in Alaska, so the show goes on for a LONG time. The sun doesn’t set until 10pm or so. Although the wind does not pick up, the temperature drops dramatically as night falls, causing patches of ground fog to appear, disappear, and re-appear. I assure my hosts that my behavior comes with my job, and it is likely getting great results. I also thank them for hosting me in their very trick camp. The cabin is very cozy, but is too tight to sleep three, so I have my tent and there is a nice soft-sand floor quite close to the cabin where I pitch. 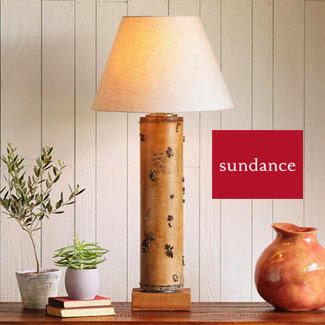 As the cabin is relatively bear-proof, they want me to divest my tent of EVERYTHING, so there are no scent traces that might attract a bear,..except for mine. Then, they hand me a shotgun with hand-loaded slug shells, and suggest I keep it next to me “in case.” They do say, however, they have never had a bear visit this bar when they have been here, and frankly, it is Southwest, there are bears everywhere I go. I can’t say that I am used to them, but I have learned to sleep soundly. NO PEBBLE MINE #335: As the two Alaska Department of Fish & Game enforcement officers and I work our way up the Goodnews River, I go ashore and climb low hills in many places, in spite of the unsettling evidence of grizzlies on the first beach at which we stop. The river remains wide, and in many places there are sizable sandbars around which we carefully navigate. One of these, further upstream, hosts our camp. I am amazed at the number of float groups fishing the river, many of whom do not have necessary permits or fishing license. I find it depressing that there are SO many that want to cheat the system. They have come great distances to fish trophy-class waters, for which, apparently, they have little regard, and they refuse to acknowledge there must be management to prevent overfishing. Our most amazing encounter is a 60-ish, white male, who tells us he was born in state, lives part of the year farther north, and then during salmon season, he comes here to fish for his “winter supplies.” The ADF&G officers know him, so we stop to board the houseboat he has built for himself, which is presently anchored to trees on the riverbank. He has no license. He has no permits. He has an illegal fish wheel trap, which he denies using. He also has WAY MORE fish iced than seems even close to legal. YET, he yells at us, saying because he was born in state, none of the laws apply to him, because he had these rights before the laws existed. The officers have heard it before, and issue him several citations. He is one of our last encounters for the day, and about 1/2 hour further upriver, we come to a section with a massive sandbar in the middle that sports a shed, a cabin, a small dock, and a lot of “Alaskan gear.” We are home. As it is getting dark, my hosts start dinner, and I wander out on to the bar to watch the unfolding of the evening’s stunning sunset. We are looking downriver, and to the west. It HAS been a good day on the Goodnews, and now, real food not freeze-dried. NO PEBBLE MINE #334: The two river enforcement officers who are helping me explore the Goodnews drainage and headwaters, have told me that I can go ashore anywhere that looks interesting, so there will be more variation to my shoot, than just from the water. After our first few early morning encounters with float fishermen, checking permits, etc., we come to section of the river with deep current along one shore, but a huge sandbar extending from the other side, and some access to a marsh area, formed in the bend of a meander (previous post). We all disembark on the sandbar, but as we do, I note that both of them break out their shotguns. I have an armed guard! Without the wind off the river, the day is sunny and warm. Being ashore offers me a very different take on the terrain, I make many pictures, and push further back from the river, into the marshy meander. Until we arrive here! It is a nice view of what apparently is a VERY popular area. The female officer also has a biology degree and identifies 9 different species of bird tracks (foreground, middle & right) in the sand. However, there are also some MUCH larger prints, going out of the frame to the left - it is a VERY big grizzly bear, and it has just walked through recently because some of the tracks still hold water. Stopping for this shot makes both my hosts nervous, so they are grateful I do it quickly, and we beat a quiet retreat to the boat. Perhaps it is time to move to another location. 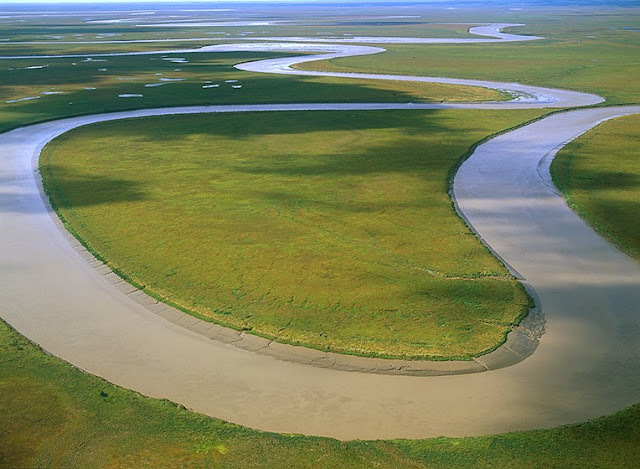 NO PEBBLE MINE #333: The Goodnews is a big, long river that has a considerable volume at its mouth, hence the ADF&G enforcement officers that are helping me explore the drainage, work with a powerful boat that has considerable thrust to forge upstream travel. It also has a fully enclosed cabin to keep us out of the wind, and because the weather is often so horrible. The officers have a job mission to fulfill, which they do EVERY DAY, working from a cabin camp about mid-river. They patrol up and down the river length, checking the endless stream of fishermen that fly in from all over the world to fish southwest Alaska. Some of those obey the laws, have the appropriate permits, and respect the catch limitations, others don’t. Certain ones believe because they are “Alaskan,” they can fish where and when they choose without limits. EVERYONE is armed. It makes my trips with them interesting. Another uniquely Alaskan issue here is Native land trespass, which my associates also enforce. Most fish the Goodnews on 10-day float trips, being dropped by air below the headwaters, and then camping while drifting to Goodnews village to be flown out. However most land on either bank is Native owned, and there is NO trespass. The floaters MUST camp only on river sandbars, which are not always where they might want to be. Many times they also disembark on select river banks to fish prime spots, which is not allowed either. We stop them, explain the rules, and issue expensive tickets. Some people are told to immediately leave the river. Some guide groups are also fined for allowing their guests to abuse the rules. It is an interesting process to watch. When not doing any of that, these officers offer to take me anywhere I might like, and they will stop so I can shoot from the land, whenever that might help. NO PEBBLE MINE #332: I am in the small Native village of Goodnews, awaiting two river enforcement officers from the Alaska Department of Fish and Game to pick me up in their patrol boat, and take me to explore the Goodnews river drainage and headwater. This is the first time I have worked with ADF&G, so I have no idea what to expect, so at the moment, I sit by the small river dock with my gear, waiting, only to be occasionally cruised by teenagers from the village riding 4-wheelers. It is a beautiful, warm day and quite peaceful by the river, so it is very clear when the officers arrive, because I can hear the noise of their engine. There are, indeed, two officers, armed with serious, holstered handguns and wearing badges. One is female. We exchange greetings, they grab my gear, and we are off. With such a great day, I go to work immediately and start shooting, while in-between, we discuss what I am hoping to do with this project. At the start of the trip, basically the delta of the Goodnews, the land is very flat and brushy. There is a downstream wind building that makes the leaves ashore shimmer as it gusts through their branches. It seems to be a good day in Goodnews! NO PEBBLE MINE #331: Delivered to Goodnews by a plane from Dillingham, I await an upriver boat pick-up from colleagues in the Department of Fish and Game. While waiting, I am surveying this small Native village, and considering what it must be like to live here throughout the year - at the edge of the Arctic Circle, on a gravel-scrub-tundra shoreline, facing into the north Pacific, and without much supportive infrastructure to speak of - this is a rugged lifestyle! Of course, everyone fishes. Freshwater fish and spawning salmon are in the Goodnews river, and Goodnews Bay opens into one of the most productive marine fisheries in the world. No one in this village, however, is a “commercial” fisherman. There are no industrial fishing boats here. 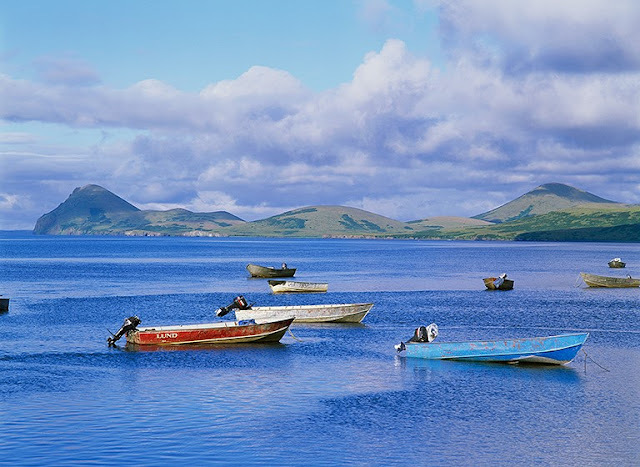 This is the fishing “fleet” for the village. It is a flotilla of Lund’s! In one of these, a skilled hunter might catch fish, or marine mammals, hunt seals, and raid cliffside bird rookeries for their eggs. 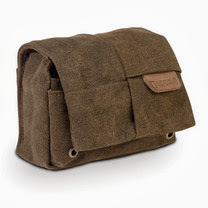 It takes a distinct skill set, and some considerable confidence to go out hunting by yourself, in one of these. 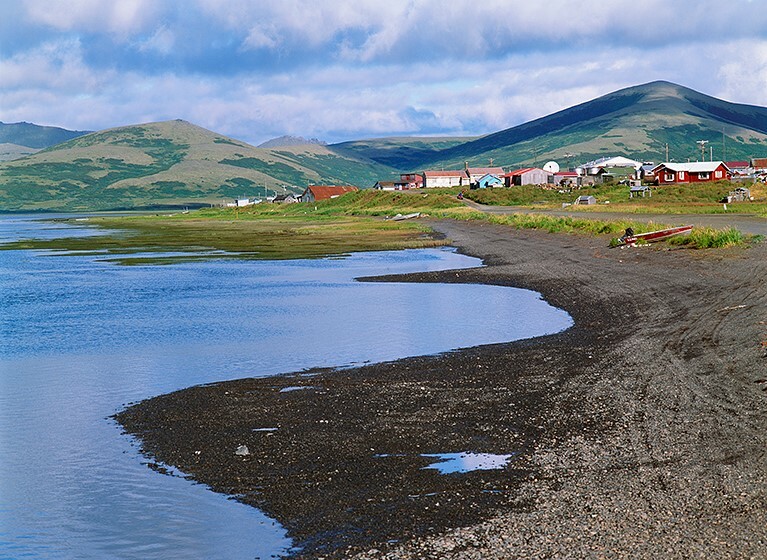 NO PEBBLE MINE #330: The Native village of Goodnews sits at the confluence of the Goodnews river, and the ocean, in a large bay that faces directly into the northern end of Bristol Bay and the north Pacific. There is a boat access area at the river, and a dirt airstrip that parallels the river, both set slightly off from the town. No streets are paved, and everyone rides 4-wheelers. There are no cars. There is a small store, and a laundry, but there are no restaurants, and there are no hotels. I am told if I have to overnight here because of weather, the best place to sleep is the floor of the laundry. From my current vantage, the surrounding refuge seems comprised of rolling hills, but as I travel upriver, I will discover it much more mountainous closer to the headwaters. At the moment, however, I have been delivered here with a load of gear and food, and I am awaiting rangers from the Department of Fish and Game to pick me up in their boat. They travel this river regularly because it is a world class fishing destination, and they check permits, catch numbers, and violations of trespass on Native land. I am going to hang with them for a few days and explore the watershed. 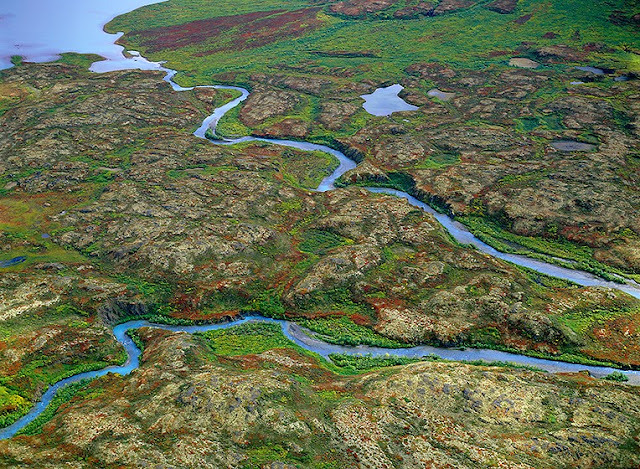 NO PEBBLE MINE #329: In the last post, I mention the wild beauty of the miles and miles of coastline in the Togiak National Wildlife Refuge, which we will eventually fly above, but now, I am going to put us on the ground to float a few principal rivers. 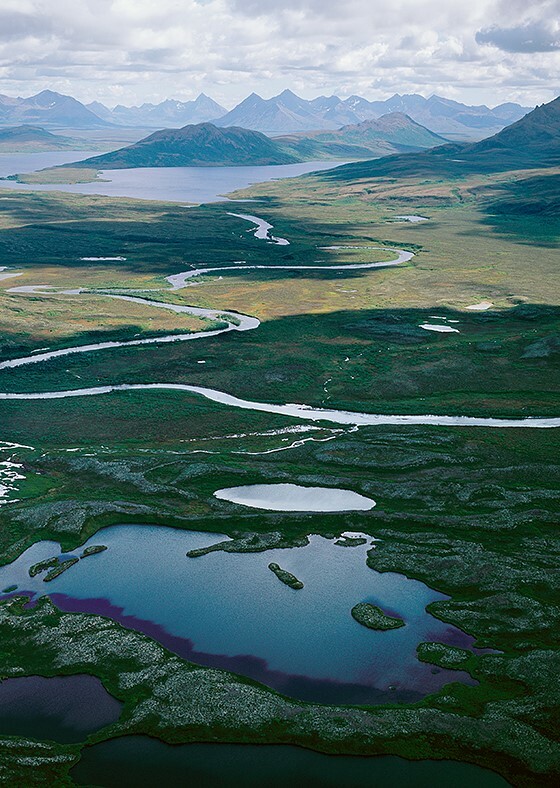 Above is the tidal estuary of a river that I do NOT float, the Kulukak, but it is certainly a luxuriant landscape. I advise you once again to be sure and follow the link, AND to use the + - to get ASTOUNDING detail at high magnification. This river system, like the Snake river I posted last week, is a stunning abstraction from the aerial perspective, and these maps are such remarkable tools. If you do go to the map in the link, zoom way out and follow the coastline north (to the left). After a substantial bit of rugged shoreline, you will see Togiak (a Native village), then another, Platinum, followed by Goodnews Bay, and the small Native village of Goodnews. This will be where I begin an upriver trip to explore the Goodnews river system. 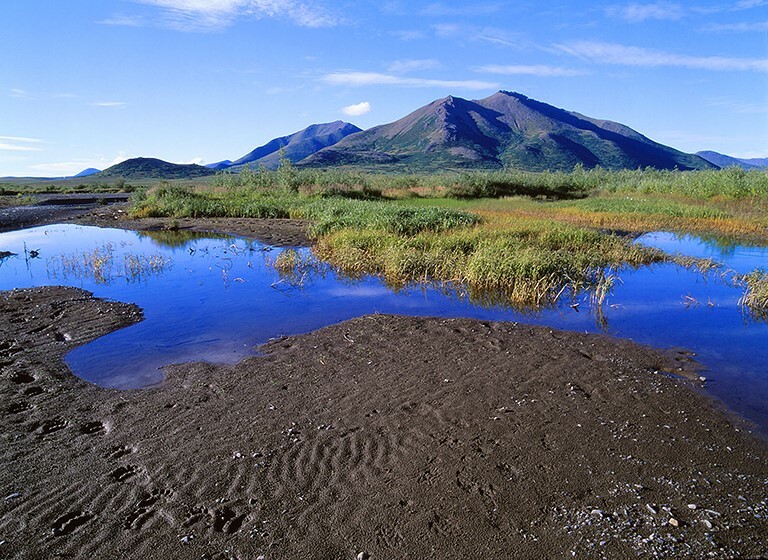 NO PEBBLE MINE #328: At the southern, eastern boundaries of the Togiak National Wildlife Refuge, the mountains subside and tundra plains slope down to the shore of the Nushagak River and Bristol Bay. 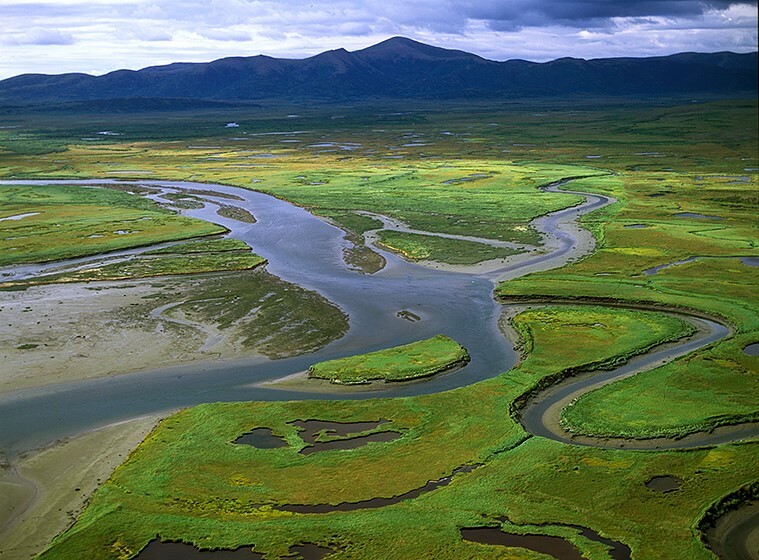 This does not mean fewer rivers than elsewhere in the refuge, it just means the rivers here have more room to meander. This is the Snake. Muddy, slow-moving, often looping back upon itself, it is an amazing graphic to be seen from above. I hope you will take advantage of the Google map links I provide. In the VERY hi-def satellite view, the Google maps reveal some beautiful abstractions of these rivers and their deltas. Be sure to use the + - features to enlarge some these very visual, natural systems. I am sure you have noticed the profusion of small lakes as well. Wait until our travels take us out along the coast. Those pictures are coming soon, and they reveal a spectacular, and lake-lined coast, with big estuaries, and miles-long beaches (where at one point I saw two grizzly bears feeding on a dead whale that washed up on the beach). 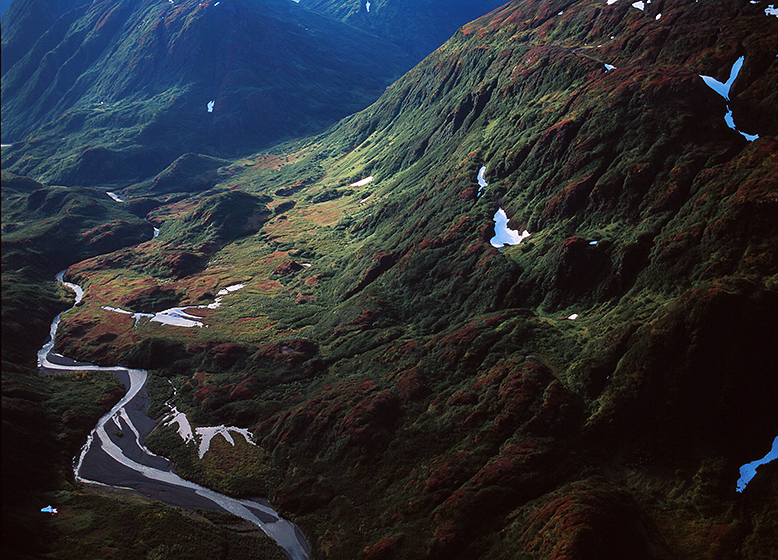 NO PEBBLE MINE #327: I fly over the Togiak National Wildlife Refuge many, many times in four years of work. Sometimes it is a flight-see, other times are en route to river floats, or visits to villages. I fly with numerous pilots, all of them local. Above the refuge, they all know the names of the largest rivers, but few can even come close to naming the myriad of smaller ones..and we are not talking streams, these are rivers. I did ask if anyone does know all the names, and was assured that each of the villages, and there are many in the refuge, knows the specific river names around them very well, and their hunters may know more because they travel farther. Nonetheless, the consensus is, no one knows them all except the mapmakers. This is a landscape that hosts the greatest freshwater diversity in North America, funneling all this down into Bristol Bay, and creating the most productive salmon fishery in the history of the world. 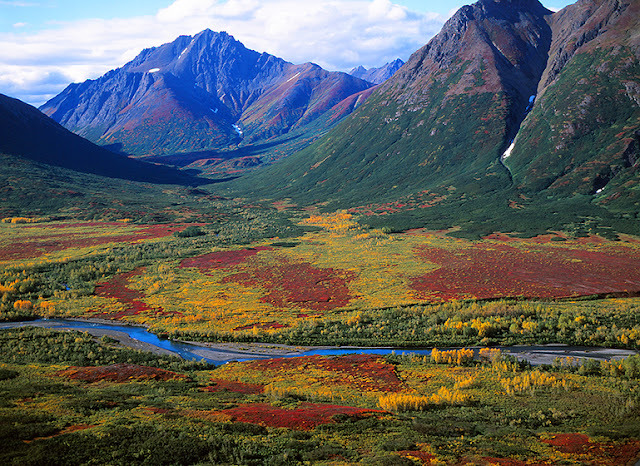 NO PEBBLE MINE! This is a world of fish. 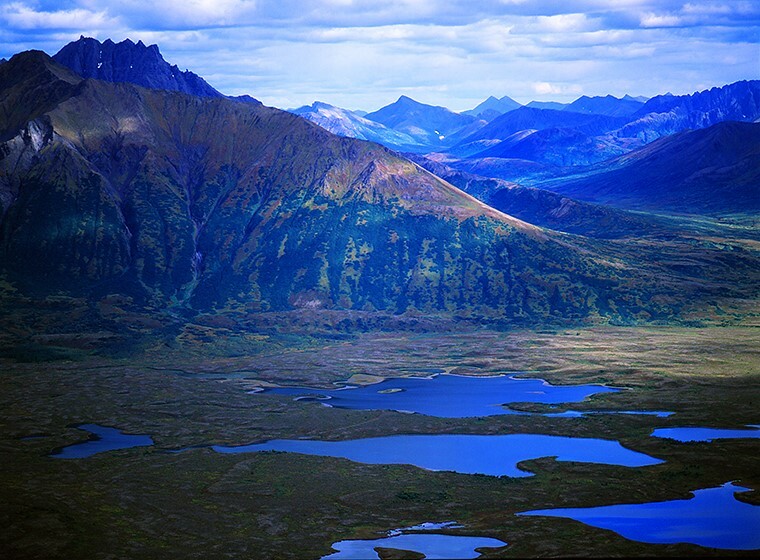 NO PEBBLE MINE #326: Over 4-MILLION acres in size, the backcountry of the Togiak National Wildlife Refuge is an endless expanse of mountains and valleys, rivers, lakes, and wetlands. Rivers are EVERYWHERE! Rivers that appear sizable beneath the wing, flow into bigger rivers that are more impressive,..and then the “big” river flows into one that is even larger. So much flowing water. Even the large rivers are numerous. 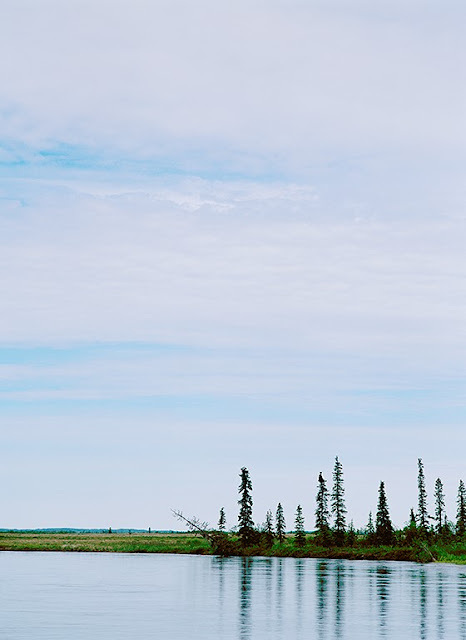 The Kanektok, Goodnews, Kanik, Kulukak, Negukthlik, Togiak, Kinegnak, and Snake (there is always a Snake) are so large they have huge tidal deltas and complexes of wetlands where they meet the coast. They exist, however, because THOUSANDS of streams and tributaries feed their headwaters. 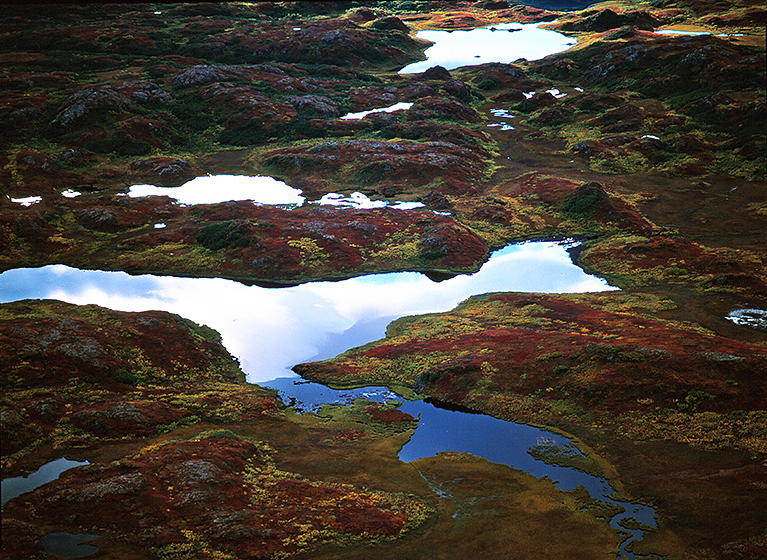 NO PEBBLE MINE #325: I do overflights of the Togiak National Wildlife Refuge numerous times and in very different seasons. I also float most of the major rivers. 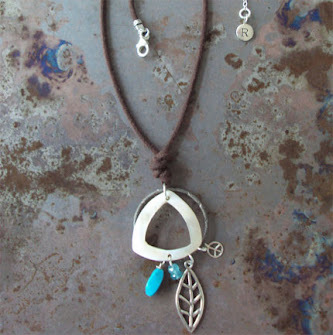 This imaginary flight will now bleed those experiences together in this blog. The last two posts feature one of my most dramatic morning arrivals in the refuge, resplendent in brilliant fall colors. Here is the other extreme. This is early spring. It rains almost everyday. The landscape is an amazing shade of emerald green, and the insect population is off-the-chart. It is good to be airborne. The Togiak refuge is home to a number of Native villages, some of which I will use as staging areas for my river floats. Those villages, and all the floating occurs on large rivers, but the backcountry is just a labyrinth of smaller streams and valleys wending their way through various ranges. This is big country, and fish, bugs, and much larger animals are everywhere. NO PEBBLE MINE #324: Our flight into the headwaters of the upper Togiak River afford of spectacular view of the plain of the Togiak National Wildlife Refuge (last post), but the river is still too small for our plane to land upon, so we turn west, following the Togiak downstream toward the Pacific. 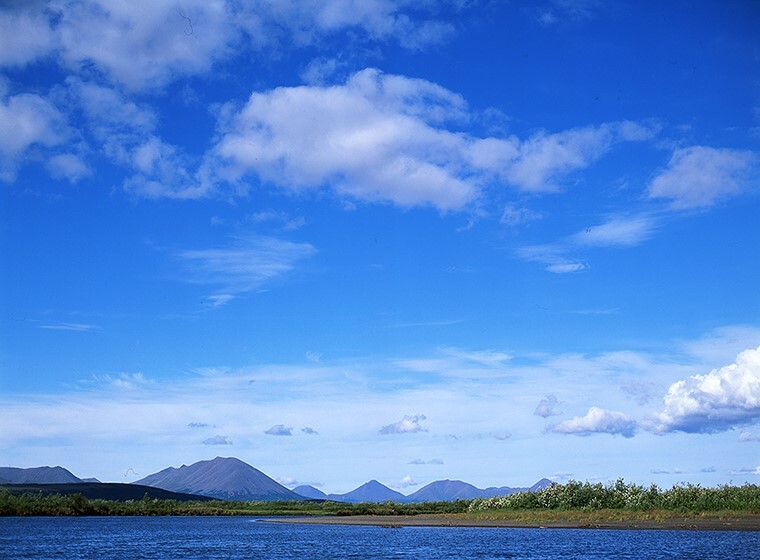 This view is now west, and all of that is the refuge, as well, including the mountains. My work around Bristol Bay has opened a world of new places to me that I can only define with superlatives. Wood-Tikchik State Park, at 1.6million acres, is the largest state park in the US. Togiak is THREE TIMES LARGER than Tikchik, encompassing nearly 4,300,000 acres. That is a lot of room for the buffalo to roam,..or in this case the moose, bear, caribou, and wolves. Lest we not forget the resplendent fishery. 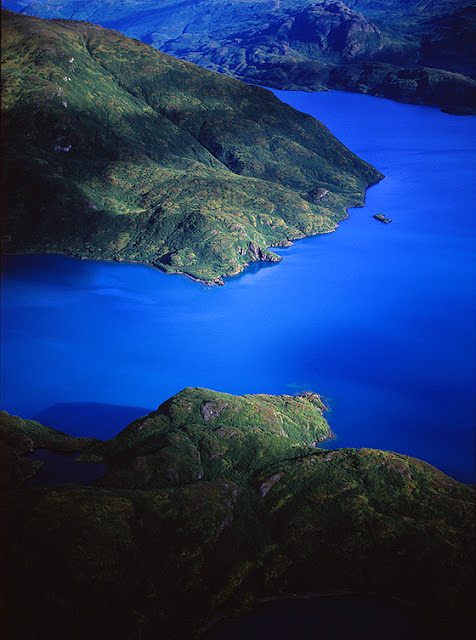 Our flight west follows the Togiak until it grows larger and broadens. Above you can see a river fed valley full of fall trees, feeding into the Togiak, swelling it evermore in size. Not much farther ahead, our flight sets down on the river, and the rest of the day is spent successfully fishing. On the eve, we return to Tikchik Narrows Lodge to eat our catch. In my next post, our imaginary flight above Togiak continues over its far reaches, so if you enjoy the view of still wild, untrammeled places, stay tuned. 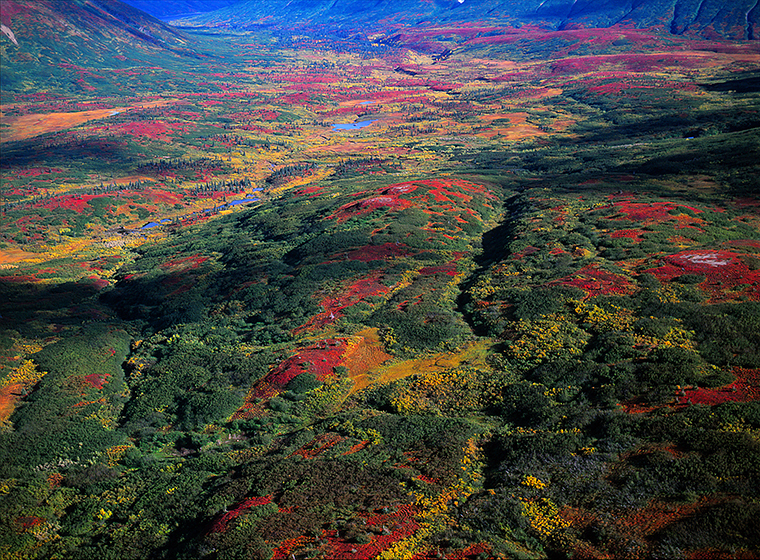 NO PEBBLE MINE #323: Over several years, I have many flights over the Togiak National Wildlife Refuge, so I am witness to the seasonal changes. Perhaps the most spectacular of these moments, occurs following the path of our present, imaginary flight. 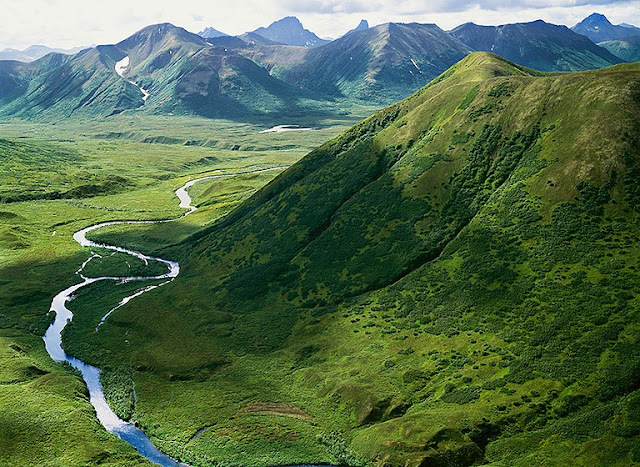 I am with fishing guests from Tikchik Narrows Lodge, and we have flown over the Wood Mountains, out of Wood-Tikchik State Park, and into Togiak, to fly fish on the upper Togiak River. 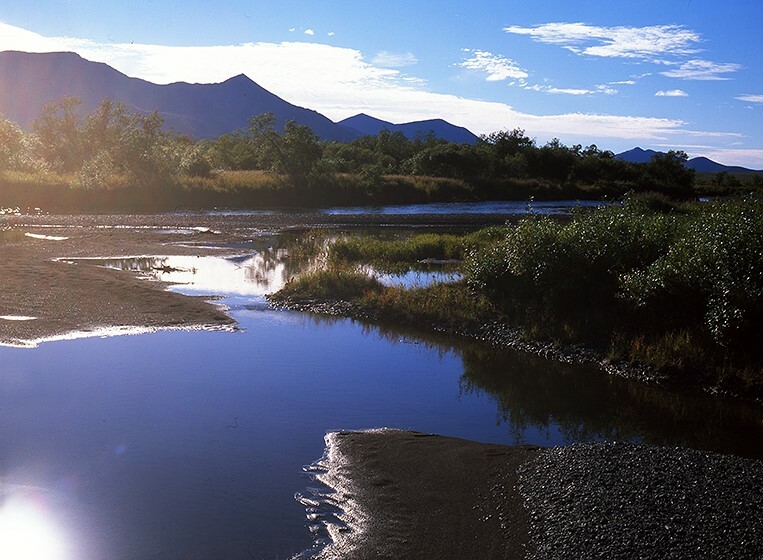 All such fishing adventures begin early in the day from the lodge, and the morning sun is just awakening the plains of the refuge, when we arrive. It is a stunningly clear day, and not only does it make the light brilliant and the fall colors glow, it gives all of us a great sense of how large the refuge is. Everything you see here is part of it, including all of those mountains... and this view is north. There is much more west, to the coast. 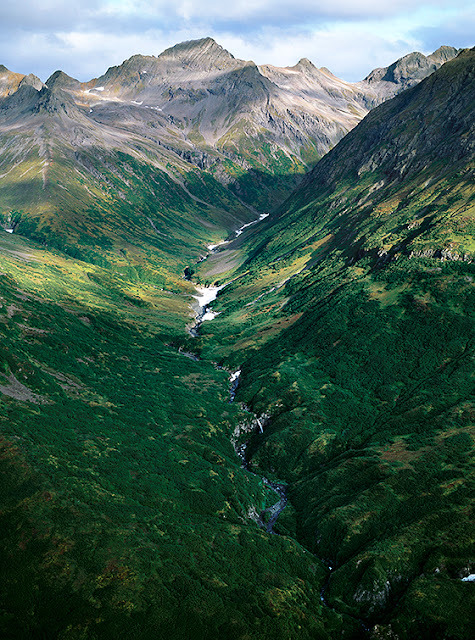 Above, you can also see a stream (coming from the left) joining the headwaters of the upper Togiak River. NO PEBBLE MINE #322: As we fly into the Togiak National Wildlife Refuge, the terrain and habitat change in a noticeable way. For one, the refuge is more expansive than Wood-Tikchik State Park, where we have just been. It is easily two or three times larger, and that difference is visible immediately from the area. The valley we are following “down” from the mountains, broadens as it gets lower, finally spilling onto the basin floor that forms the refuge. Below our wings, several streams merge, and I can see others pouring in from elsewhere. Then, a number of lakes appear, into which these drainages are feeding. The pilot tells me that we are in the headwaters of the Togiak River, which we will now follow to the coast, and these are part of the Upper Togiak Lake(s). 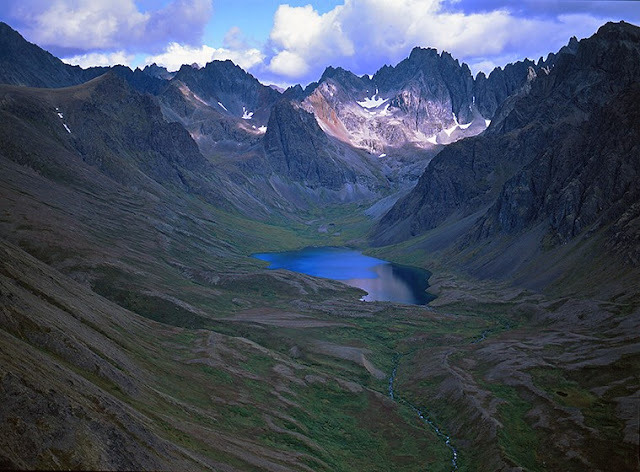 This parting view shows the headwater lakes, and looks south and west, back into the distant peaks which are part of Tikchik. 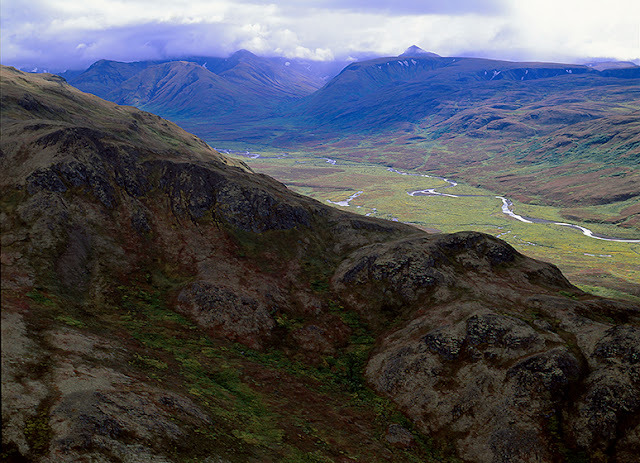 NO PEBBLE MINE #321: Similar, but not the same, the landscape beneath our wings suggests the familiar high valleys of Wood-Tikchik State Park, and yet the terrain here seems more expansive and less vertical. The summits are not as rocky, and the bush is more tundra than dense thrash. There is still A LOT of water everywhere, and every valley supports a river system, all of them descending into the Togiak National Wildlife Refuge and ultimately, flowing into the fishery of Bristol Bay. 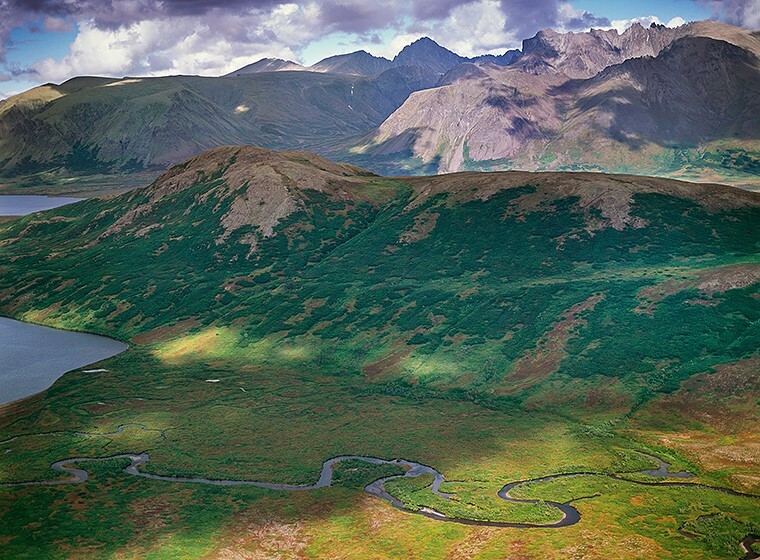 I would never refer to Wood-Tikchik as small, at 1.6-million acres, it is the largest state park in Alaska, and arguably, also in all of North America, BUT as we leave the mountains and enter the refuge, I immediately sense a MUCH LARGER ecosystem at the foot of these new and different mountains, and across this basin to the sea. 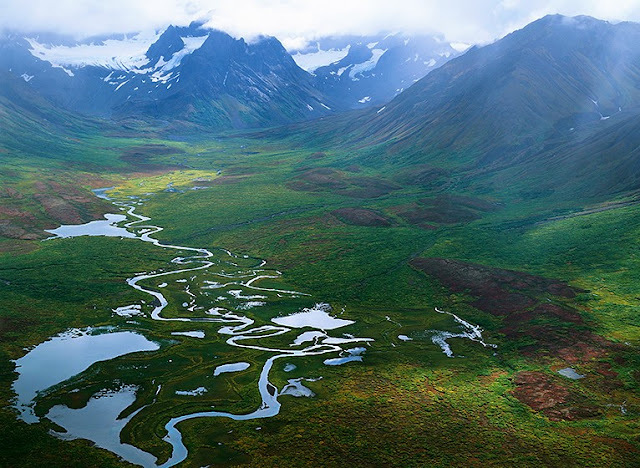 NO PEBBLE MINE #320: Squalling weather rolls over my pilot and I while we are on the ground at Heart Lake, and after it passes, we agree that we should return to our specific purpose of passing over the Wood River Range and into the Togiak National Wildlife Refuge. As quickly as the rain came, it is gone, and the wind dies down, too, so we are off. As I look out over this terrain, I do not yet realize how alpine, and VERY different it is, from other landscapes I have flown above, but that will now change quickly. We are headed north and west, leaving the Wood mountains behind, and soon to see a similar, but not the same, rugged, wild terrain that forms the refuge. 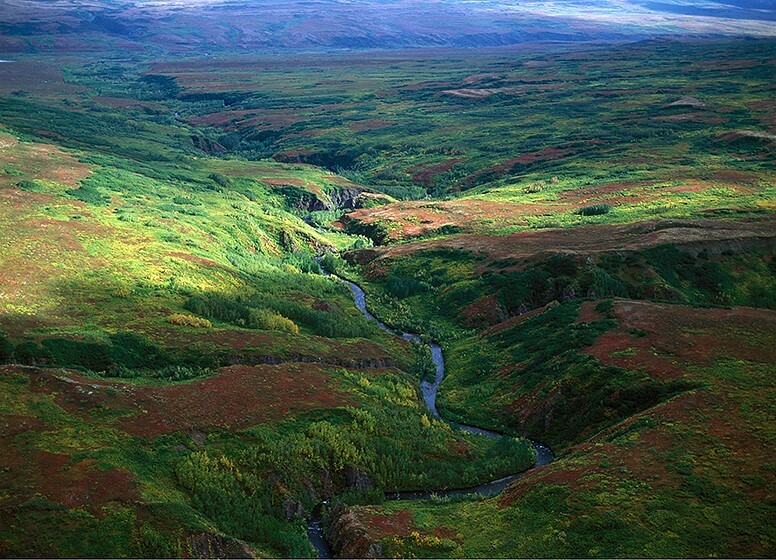 Togiak is headwaters to numerous rivers that feed into the Bristol Bay fishery, and we will now explore them from above. I float most of them as well. Stay tuned! NO PEBBLE MINE #319: Camera and tripod in hand, I wander around the shoreline of Heart Lake for a distance, mostly caught up in the rain saturated fall colors of the tundra, in contrast to the pale blue color of the water. Sometimes you just work too hard to see what you expect, and you fail to see “the surprise.” There always is one. This is mine for the day (above). Eventually the weather begins shifting back into rain, so I begin a return to the plane. In so doing, I surmount a small rise of tundra, and am presented with this POV. I am sorry my blog has no sound, because at this moment, the wind is, literally, howling around those summits, and the clouds are being torn into tatters. Camping up here would be a VERY interesting experience. For now, however, it is about to storm on us, and my pilot and I are on our way into the Togiak National Wildlife Refuge. We have just been sidetracked up here for awhile,..then, this happened! 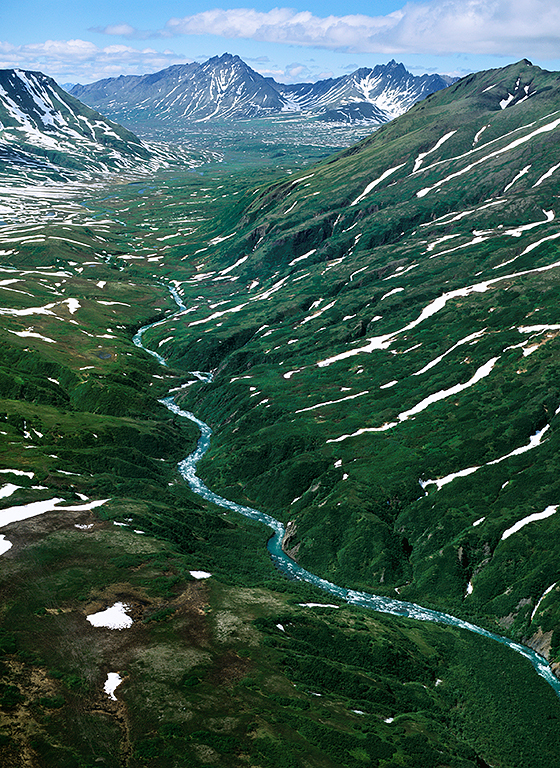 NO PEBBLE MINE #318: As we follow the meandering valley beneath our wing, the water in the river becomes increasingly pale blue in color, indicating it contains little soil and is almost entirely glacial meltwater. We are also not far above the ground, but we ARE high in altitude. The dense bush gives way to tundra and exposed granite,..and what the pilot says is Heart Lake, appears. It is jewel-like,..a pale sapphire blue, nestled into a colorfully dappled, tundra-lichen bowl, surrounded on three sides by impressive summits. 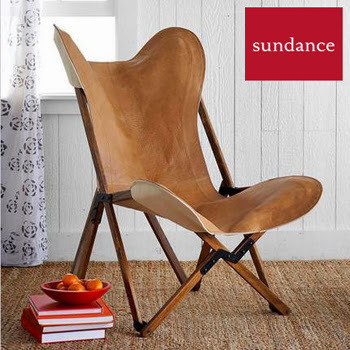 It is easily large enough for a landing and so we do. Disembarking to shore is simple, and coincides nicely with a break in the weather, When the sun comes out, it causes the rain-droplet-covered tundra to sparkle. There is lichen everywhere, and in every color and shape imaginable. This is clearly an attractive place to feed if you are a caribou (they eat mostly lichen), and with the dense Alaskan bush at bay, hunters can move around a greater range of the landscape, so I understand why he brings his hunting campers here. Today, I am armed, and shooting,..but not at caribou. 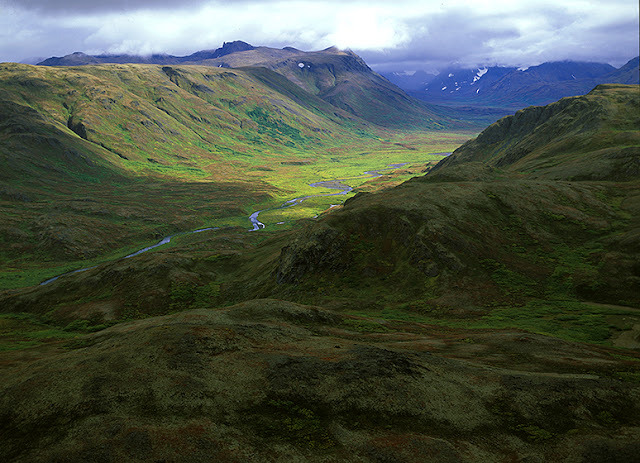 NO PEBBLE MINE #317: Wending our way through high mountain valleys between Wood-Tikchik State Park and the Togiak National Wildlife Refuge, our flight encounters spats of nasty weather, which then give way to spotty sunlight, before encountering another round of rain squalls. It is not risky flying because visibility is good, and it IS beautiful, as the landscape beneath the wings, sparkles and glows in lush, vibrant, VERY wet, saturated color. Smaller, more shallow lakes are now starting to give way to larger bodies of water, and this is the first one we flyover that is large enough to land upon. My pilot says we will continue to another that offers “access,” so that I can walk around a bit. He thinks this lake is surrounded by such dense bush, just getting ashore will be difficult. NO PEBBLE MINE #316: As we depart the huge rolling, tundra-covered hills, and approach a more mountainous terrain, the weather intensifies and there is a good deal of rain in passing squalls. The landscape is becoming evermore alpine, and trees have all but disappeared. The expansive tundra looks like green velvet in the haze of rain curtains. Larger lakes than we have previously seen, appear, but none of them are big enough for us to land. Nonetheless, I know this pilot has been here before, so we are not flying “blind.” He does have an intended destination where he expects to put me on the ground. This past hour has been one of the most remarkable journeys I have ever made. Aside from A LOT of animals, especially caribou and bear, there is nothing in this alpine world but undisturbed wildness/wilderness. I would gladly come back here to camp at some point, but that is not happening this day. However, I am about to find a great campsite where I can get out and “stretch my legs.” More likely, I am going to take my cameras and run around like a wildman, trying to drink in this amazing place from ground level. NO PEBBLE MINE #315: As we fly toward what my pilot promises will be a lake large enough to land upon, we follow this river valley for a good distance. I am VERY SURE this is one of the most extraordinary and beautiful places I have ever seen, and certainly one of the wildest and most untouched. This is BIG water! Those are large, deciduous trees growing up the embankment in the immediate foreground. My pilot says he knows there is great fishing down there, but no one is crazy enough to try and get to it. As you can see by following the direction of this river, it is really a gorge that runs for a couple of miles, and then it merges into a much broader river valley. Our flight will follow the gorge to that valley, and then we will bear to the right, following the broader valley out of the rolling hills and into a part of this terrain that is more mountainous. That is where he says we will find a lake large enough that we can land. 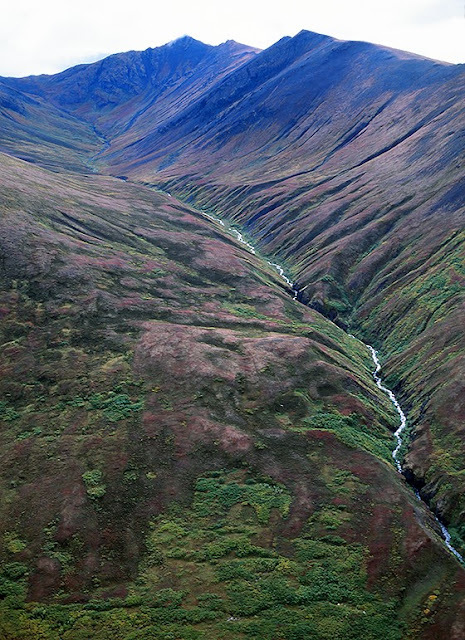 NO PEBBLE MINE #314: My pilot tells me that he occasionally brings hunters up into this world of huge, tundra-covered rolling hills, and lush river valleys, but he notes that there are only a few points of access for them, and most of the terrain is SO untracked and rugged, that it limits their ability to move about. Obviously, there are no landing strips up here, so we are headed for a lake to land upon, so that I can get out on the ground and have a look around. I do see some small lakes, and occasionally clusters of tundra ponds, but nothing in my field of view is big enough to host a landing. A pilot needs a lake of a certain size to accommodate both a landing AND a take-off, and since we have entered this domain, I have not seen a big enough body of water for us to put down. Nonetheless, he assures me we are headed towards one, so we fly on, slowly approaching some very pronounced summits. NO PEBBLE MINE #313: On the day of this flight, you can see that there is a lot of weather rolling through, but the clouds remain high and our flying visibility is good,..sometimes even JUST AMAZING! as a spot of sunlight illuminates one of the verdant valleys in the “lost world” we are now above. 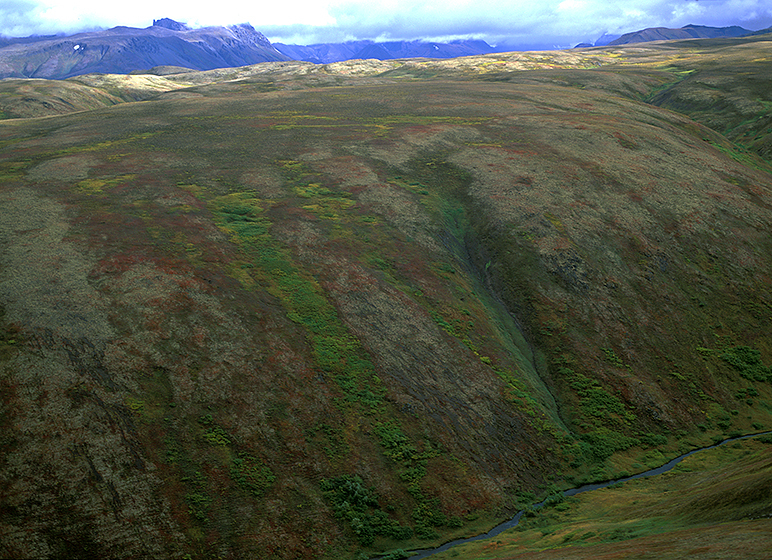 As always, scale here is difficult to determine until you are down on the ground, but that is a BIG river and a valley that looks like a set designed for “Game Of Thrones.” As we round the corner of the shadowed foothills to the right, we find a small herd of caribou (15) grazing in the tundra below, and a little further down this valley, two bear are playing in the river. I am excited that we might land, as I would like to see if you can walk around in this terrain, and I DO want to have a ground-level sense of this place. NO PEBBLE MINE #312: As we fly on over this new (to me), high elevation terrain of tundra and rolling domes that marks our departure from Wood-Tikchik State Park, and our entrance into Togiak National Wildlife Refuge, I am surprised by this area my pilot refers to as a “lost world.” It is very different from the ruggedness of the Wood Mountains. He says on rare occasions he brings hunters into these high plateaus to pursue moose and caribou, but mostly, this place is just VERY wild. When I ask about landing, he says we will soon see some lakes, and we will land on one of them to “get out and stretch.” In the meantime, the hills and valleys continue to roll by beneath the wings. NO PEBBLE MINE #311: As our flight leaves Wood-Tikchik State Park and flies northeast over the Wood Mountains and into Togiak National Wildlife Refuge, I am surprised by the terrain change. The summits of the Wood Mountains are rugged, and in many places still hold snow. To cross over them we have risen through high mountain valleys, often cascading with water. Now, we have entered an entirely different world. 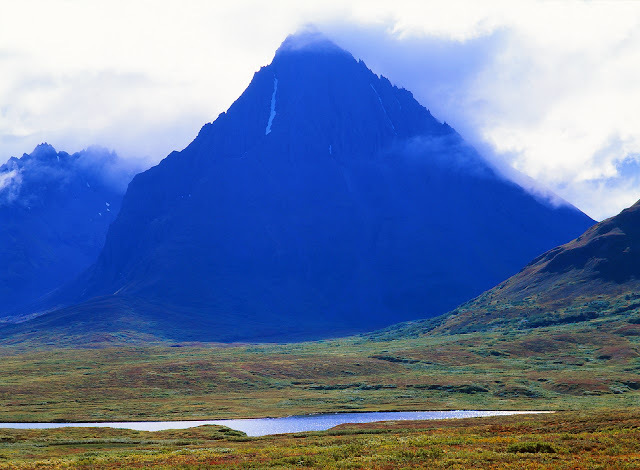 With the more ragged peaks fading behind us, we are suddenly over a high elevation terrain of rolling hills, broad valleys, and endless tundra but few trees. 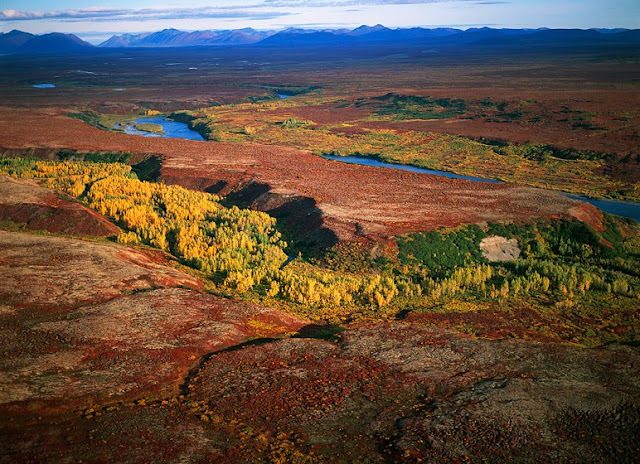 The pilot explains that these high valleys are prime moose and caribou hunting, and that so few people come up here, it is like a “lost world." 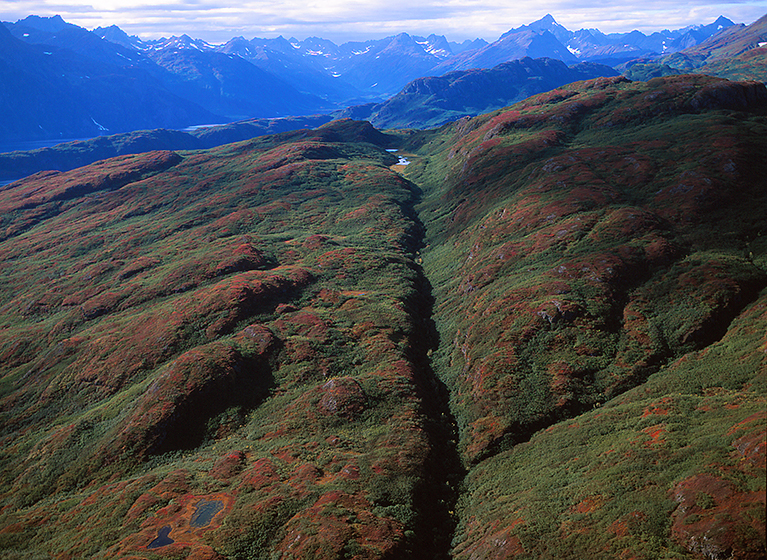 NO PEBBLE MINE #310: Nearly to the top of the Wood Mountains and out of Wood-Tikchik State Park, into Togiak National Wildlife Refuge, the terrain beneath the wing is in transition. The green thrash and tundra openings are giving way to rock and boulder scree. Caribou can be seen quite often, and bear are wandering high meadows, gorging on berries and carrion from winter-kill. This is a remarkable flight on a good weather day, but on a bad day it can be very unsettling. Winds in these high valleys come abruptly from differing directions, and when I was flying in the small SuperCub back in the park (posts #279-299), those gusts really surprised us and pushed us around. The last post offered some scale by pointing out a herd of caribou on a snowfield, so try this - do you see the waterfall in the lower third of this frame? How big is that? NO PEBBLE MINE #309: Ascending evermore rapidly now, our “flight” from Wood-Tikchik State Park over the mountains and into the adjacent Togiak National Wildlife Refuge finally reaches true alpine. 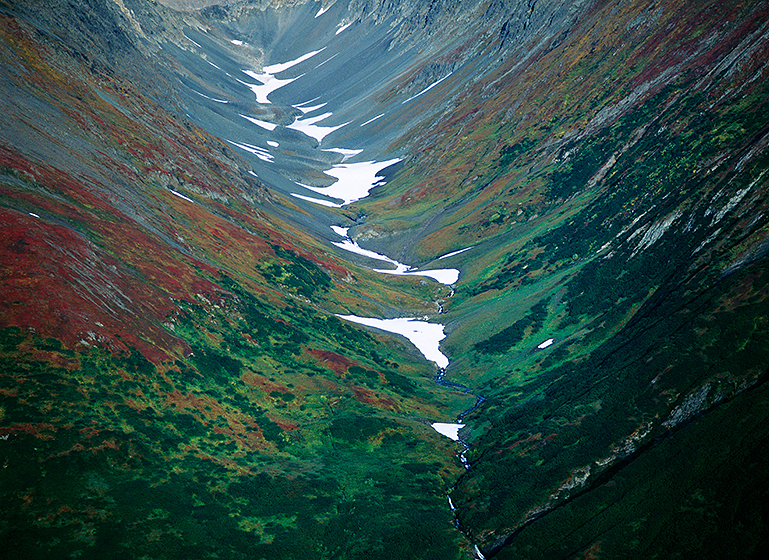 Summits surround us, and side-valleys plunge back into basins like the one in this image. Although just barely visible in this shot, note the dark dot on the first big snowfield at the bottom of the frame. That is 25-30 caribou, lying down on the snow to escape being bitten incessantly by mosquitoes and bot flies. Amazingly, higher up in the range there are places to land, and pilots bring caribou hunters in regularly, to camp and hunt. NO PEBBLE MINE #308: Our “flight” is in the last stages of leaving Wood-Tikchik State Park, and flying over the Wood Mountains, into the Togiak National Wildlife Refuge. The previous posts gave us views of the big lakes, expansive tundra, and broad lower valleys of the park. Now, we are ever-ascending, and although we are not yet alpine, this is a VAST elevated river valley that we are following “up.” That is significant whitewater down there. That river is raging, and surely, snow-melt cold. What a world! I wonder if any kayakers have ever tried to run this? 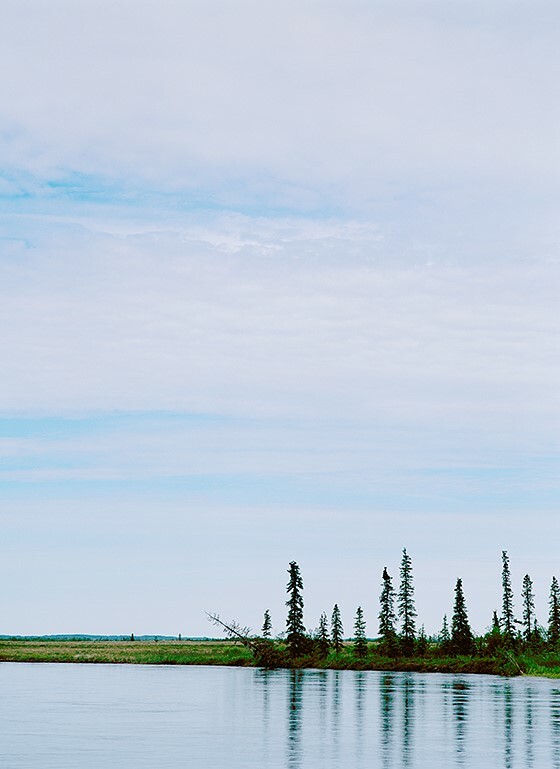 NO PEBBLE MINE #307: Leaving the lake shorelines, the DENSE bush is virtually unnavigable, but nonetheless, stunning to view. We are heading north and a bit west, crossing over the Wood Mountains in Wood-Tikchik State Park to enter the backcountry of the Togiak National Wildlife Refuge. As we gain elevation in Tikchik, the terrain not only steepens beneath our wing, but it becomes more rugged. There are many animals below, but few people would want to be down there wandering around. Even this late in the summer season, we will still see snow in places, and as with the park, there is water everywhere. Southwest Alaska is the most pristine, American, river-lake habitat left to our nation. 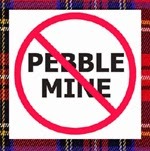 Let’s keep it that way and continue to SAY NO TO THE PEBBLE MIINE. 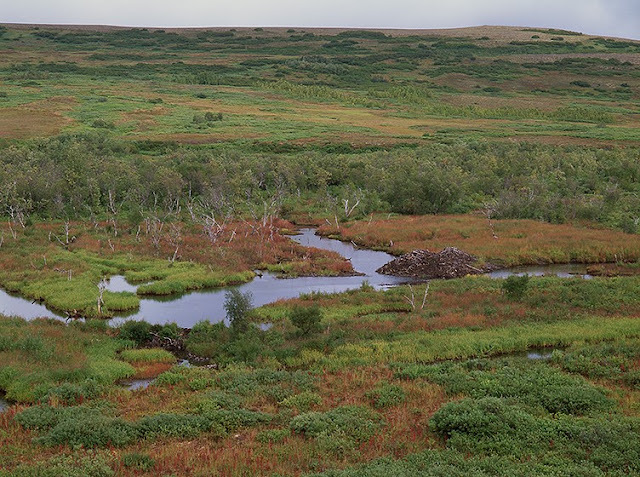 NO PEBBLE MINE #306: As this blog has already explored the backcountry of Wood-Tikchik State Park, some of this transition over the Wood mountains to the Togiak National Wildlife Refuge will seem familiar. Leaving the lakes, our flight follows broad rivers valleys steadily upward into higher elevations. 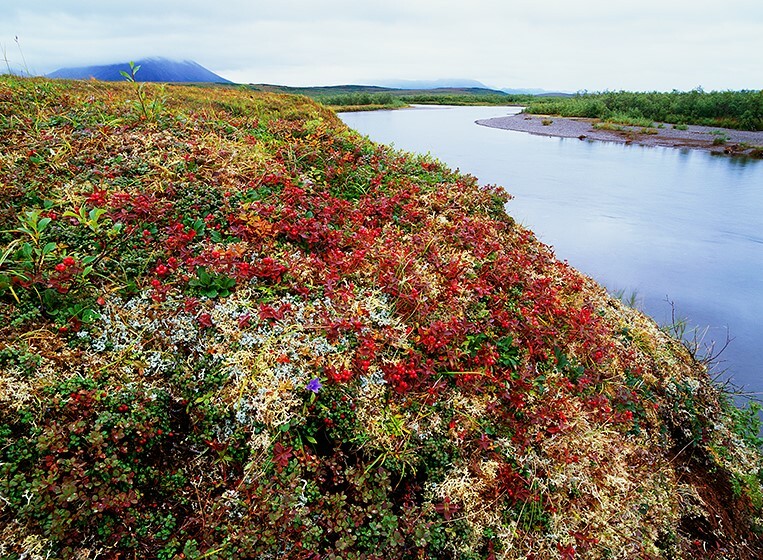 Autumn in Tikchik is an unparalleled display of tundra color that only last about 14-days, so I thought I would leave you with this one last especially luscious shot. What a world! AHH! To be a moose on the loose! Our slow gain in elevation is going to take us from the land of moose,fish, and bear, to a world with caribou and wolves. 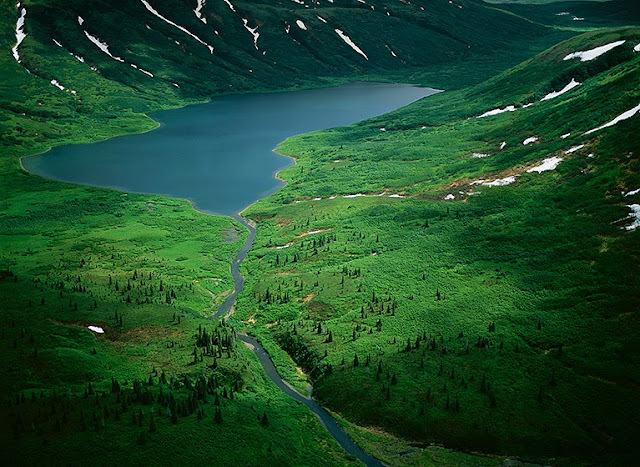 It is a world of tundra and few trees, but this is the home of alpine lakes, the source collection for much of the water that flows down these valleys. 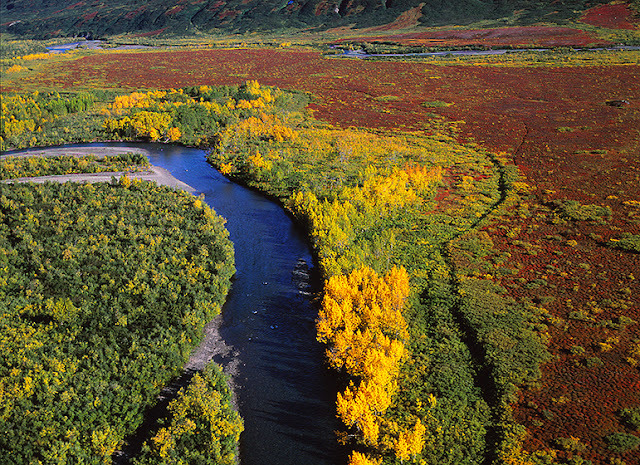 NO PEBBLE MINE #305: As we leave Wood-Tickchik State Park and cross over into the Togiak National Wildlife Refuge, I am taking one last look around at the remarkable landscape that comprises this habitat of rivers, lakes, and mountains, and provides about 1/3 of the headwaters for the Bristol Bay fishery. Togiak will also have lakes, rivers, and magnificent terrain, but there is nowhere else I feel as radiantly alive as this park. Where the lakes are concerned, the fact many in the park come from glacial melt probably affects there constantly startling coloration, that are like few other bodies of water I have flown above. From here our flight rises a bit to follow a broad river valley, and then we will begin to climb towards alpine. Goodbye Tickchik Narrows Lodge, and once again, thank you very much, Bud Hodson, for allowing me to SEE this remarkable place. NO PEBBLE MINE #304: As our imaginary flight departs Wood-Tikchik State Park for the Togiak National Wildlife Refuge, I have a few “favorite “ places that I have come to appreciate in this park that we will pass over. As I said in the last post, the sheer verdancy of Tikchik sends off some kind of living-force radiance, and from the air, that always seems especially extravagant around the edges of the big lakes. The best of these lakes host convoluted shorelines that support beaches with quiet bays, and rolling dome terrain, pocketed with numerous small lakes. This is a difficult landscapes to negotiate on foot, because the vegetation is SO dense, AND there both bear and bugs waiting to have a snack suddenly appear,..you! Nonetheless, this is a wild, living, vibrant wilderness that can be enjoyed and observed. Considering what we have done to most of the planet, it might be a good idea to pay some attention to the ecosystem of Southwest, and LEARN from it, instead of imposing ourselves, yet-once-again, on something that we alter and damage, often permanently. Google this history: start in Nova Scotia, go down the entire eastern seaboard, round Florida into the gulf and across Texas, jump to Baja, then go north along the Pacific coast. These used to be American fisheries, some of the world’s MOST PRODUCTIVE, both in food and jobs. They are almost ALL gone now. What is left? 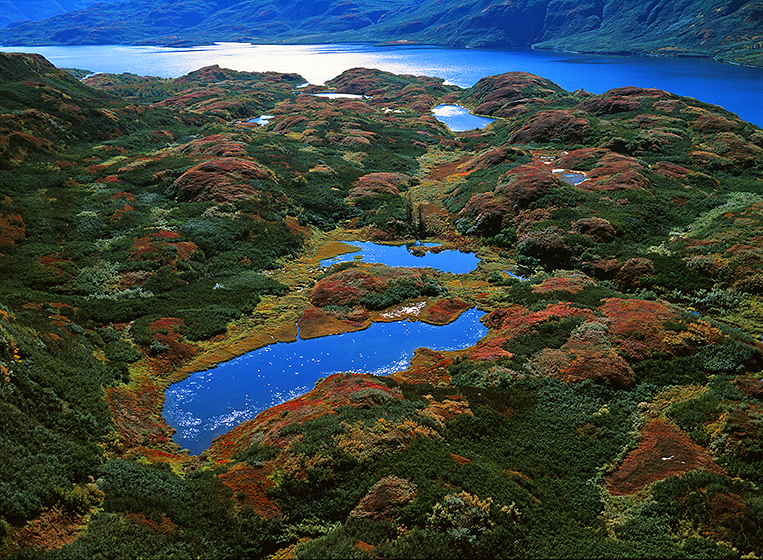 NO PEBBLE MINE #303: Tikchik is more than just the spectacular fall, however, as I have tried to show with the winter images. What I can only hint at in these pictures is something more primal about being in the park. My flights/these images bear witness to creation that is relatively undisturbed and richly evolved. As the glaciers retreat in the higher elevation and the rocks emerge, it is not long before vegetation begins to establish itself. Given the marine influence, the significant rain, warm summers, and long growing hours, life explodes. The tundra establishes. Fish establish and spawn, then die to become super-food for EVERYONE, bears, birds, and TREES! Thickets and cottonwood groves establish along streamsides, other species follow, broadening out across the valley floor. From the backcountry stream headwaters (last post), to the big valley floors with mature rivers, and on to the lakes and plains, what I see in looking back through these images, is magnificent, thriving GROWTH EVERYWHERE. Looking down upon it from a plane while making pictures, I could feel through my eyes, the radiant energy of the world flourishing below, like no other place I have ever visited. NO PEBBLE MINE #302: As this blog is about to transition from Wood-Tikchik State Park into the Togiak National Wildlife Refuge, and we take our last pass over the terrain of Wood-Tikchik, I spent the last few posts reminding everyone why the Southwest area is so unique, and why those resources should not be threatened by the proposed Pebble mine. Now I would like to thank those that helped me create the images you have seen posted. 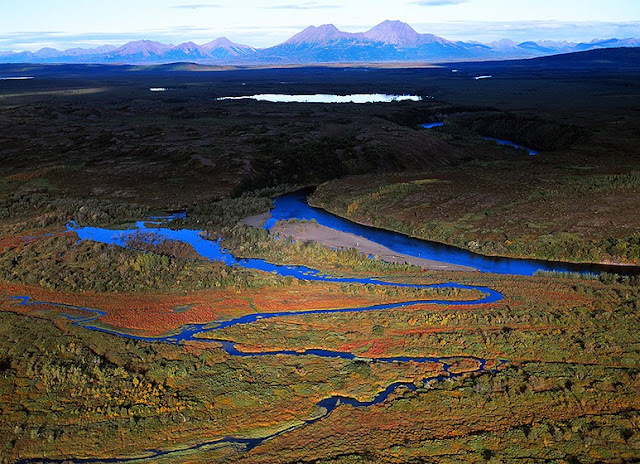 When I was doing the fieldwork for my first book on the area, Rivers Of Life: Southwest Alaska, The Last Great Salmon Fishery, I overflew Wood-Tikchik many times because it accounts for about 1/3 of the Bristol Bay headwaters, including the significant fishery of the Nushagak river. I had many more good pictures from the park, that did not fit the edit for Rivers Of Life, and I remembered my friend, Jim Stratton, who really raved about the beauty of the park, was now the Director of Alaska State Parks. When I called him to ask his interest in a book about the park, he said that he and his office were in, and he would offer help and contacts. Jim went on to contribute the preface for my book, Wood-Tikchik: Alaska’s Largest State Park' Among the contacts to help me access the park, was Bud Hodson, owner of Tikchik Narrows Lodge, whom I have noted many times in these posts. His willingness to allow me a room at the lodge and window seat in his planes gave me the many pictures I hope you have been enjoying. At 71, I have seen a great deal of the world, and I would say, flying over Wood-Tikchik, right after a rain, at the height of fall, is one of the most beautiful. NO PEBBLE MINE #301: The thriving, relatively undisturbed habitat of southwest Alaska hosts a collective of hundreds of rivers, and thousands of lakes that feed into the fishery of Bristol Bay. This is not only THE MOST PRODUCTIVE COMMERCIAL WILD SALMON FISHERY IN THE WORLD, it also harvests record challenging cash-crops of herring, and numerous species of crab that can be found nowhere else. The commercial fishery of Bristol Bay is a $1-BILLION-per-year, RENEWABLE RESOURCE industry that employs over 100,000 people, and the largess spreads to many other states, besides Alaska. This commercial catch is the most obvious part of the economy, and the one most used as a reason to SAY NO TO THE PEBBLE MINE. While I don’t disagree about the value of the jobs and the fishery, it is NOT the whole picture. Southwest's stunningly rich freshwaters provide some of the finest recreational fishing anywhere, and wealthy sportsmen from all over the world spend significant time and money to come here. Further, the least developed aspect of Southwest are the parks, which at the moment are accessible, but barely developed for the public in any great numbers. 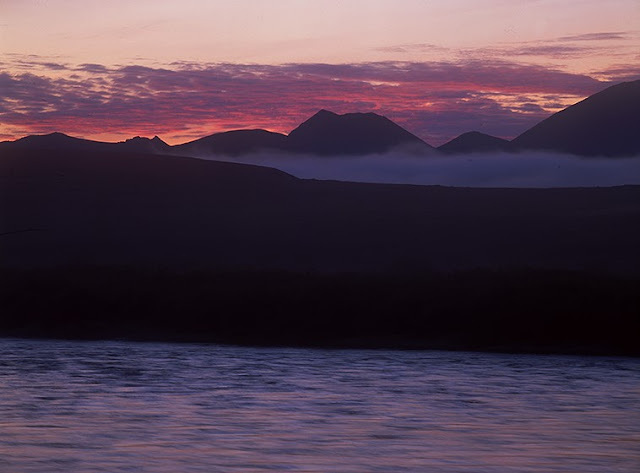 Yet, a recent fiscal analysis of park tourism surprised many, because it discovered Katmai took in twice the money expected, and demand to visit seems to grow with every passing season. I can tell you personally, these parks rival, or ARE GREATER than any parks in the lower-48 I have visited, and when they are finally intelligently developed, they will generate revenue that will match or exceed any of the others. As importantly, many, many Alaskans fulfill the jobs described above, and more might work in Southwest if the parks are properly developed. Again ALL OF THIS is ANNUALLY RENEWABLE industry,..FOREVER if well managed!